The 13" blade is Japanese manufactured to Fanno's custom specifications of high, flat ground saw stock with the tri-edge tooth design. 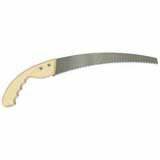 The razor sharp blade with 6 teeth per inch gives you an extra smooth cutting action that is remarkably clean and fast. The marine grade laminated hardwood handle is comfortable and durable.